Last week, I shared with you the story of the state tourism agency that has wasted and abused your taxpayer dollars. They are an independent agency that does not report to the Governor’s Office. This week, I am highlighting a state agency in the Governor’s cabinet which has been working to run their operations more like a business and deliver services to taxpayers in a cost effective and timely manner. That agency is the Nebraska Department of Environmental Quality (NDEQ), the state’s top environmental regulatory agency. They are providing a higher level of service and trimming costs all while stepping up their commitment to help protect Nebraska’s clean air and clean water. Last fall, I shared with you the news that NDEQ had begun to offer some of their environmental quality permits online in an effort to streamline their permitting process and cut red tape. Nebraska is one of only four states in the nation that offer permits online. In November, NDEQ launched the online application for general air construction permits to streamline processing of similar types of projects so the regulatory process does not prohibit companies from helping grow our state. This has also allowed the agency to reinvest cost savings and resources into larger, more complex permitting for projects. Making state government more customer-friendly has been one of my administration’s top priorities to help grow our state. Thanks to the online application process, NDEQ has reduced the time it takes to process air quality and storm water permits from weeks and months to an average of one day. NDEQ Director Jim Macy has said the success Nebraska has experienced with their online application process has generated interest from other state environmental regulatory agencies, who are considering online applications. A couple weeks ago, I had the opportunity to join Yahoo, the tech company that runs one of the largest search engines worldwide, to discuss how the culture change at NDEQ has dramatically accelerated their delivery of permits. This change in culture helps businesses like Yahoo expand and bring the jobs we need to keep Nebraska the best place in the world to live, work, and raise a family. Last month, Yahoo was the first customer to receive service through NDEQ’s new online application for their emergency engine general construction permit. The permit was a part of a $20 million expansion to increase capacity to power Yahoo products and services at their data center located in La Vista, Nebraska. At a news conference, Yahoo’s Senior Director of Data Center Operations Mike Coleman credited the new business-friendly culture at NDEQ with helping businesses like theirs expand operations. 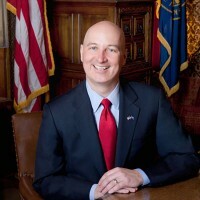 In his comments, he said Nebraska stands out nationally: “A permitting process that can take months in other states can now be completed in a matter of days, right here, in Nebraska. It’s because of this and the talented people in this great state that we are at home here and continue to grow our business in Nebraska.” In addition to their data center operations, Yahoo also mentioned Nebraska’s business-friendly culture has allowed them to insource additional jobs, such as accounting and customer service jobs, to Nebraska. In the coming months, NDEQ will continue to look for new ways to deliver services in a customer-friendly manner while fulfilling their core duty of protecting our clean air and water. They already have plans to launch another online application, this time for incinerator general construction permit applications. This is just one of the great success stories from our state agencies who are focused on running government more like a business and making services more customer friendly for you. With Yahoo, state government’s customer-friendly culture helped ensure the timely expansion of their data center. Not only has our business-friendly environment helped their data center, but it has also helped attract additional jobs to our state. All of this is pivotal to growing Nebraska. If you have any feedback on your experience with state government, I hope that you will take the time to contact my office at pete.ricketts@nebraska.gov or 402-471-2244. I look forward to hearing from you!